The light from remote globular clusters should be blue according to theory because the further away one looks the further back in time one sees. It seems as if each new observation from the Hubble Space Telescope or the Chandra X-ray Observatory adds fuel to the Electric Universe fire. Funded research groups, on the other hand, are constantly finding new stellar entities or peculiar galaxies that require them to attach addenda to existing theories. Now astronomers are faced with yet another observation that they are "struggling to explain." A recent announcement from the Hubble team states that there are clusters of stars orbiting another galaxy over a billion light years away that aren't behaving as conventional understanding suggests – rather than being blue-white they are red. Scientists use a measuring rod for the universe that is based on expansion out of a primordial explosion, they believe that the further out into space they look they are seeing the universe as it was closer to the beginning. Because objects located at 1.2 billion light years are supposed to be as they were 1.2 billion years ago, the expectation is that any stars that are observed at that distance should be youthful, near the beginning of their lives, with rich supplies of hydrogen fuel. In that case, the stars ought to be burning hot and blue, radiating high frequency x-rays and extreme ultra-violet light. Globular star clusters are normally found in a halo around galactic nuclei. They are thought to be structures that have been gravitationally attracted to the host galaxy because many of them have the appearance of age – they have large populations of red stars that are supposed to be old stars. Some theories speculate that the clusters might have been ejected from a host galaxy, or that they formed in conjunction with a host galaxy. No one can be sure, but the ratio of blue stars to red stars is commonly used to indicate an overall age of one cluster in respect to other similar globular clusters. As the Hubble press release pointed out, however, many clusters in a remote galaxy are filled with stars that appear much too red for them to be so young. According to Jason Kalirai of the University of California, Santa Cruz they found 195 clusters in the galaxy with, perhaps, thousands more too dim to see right now. Because current models rely on the principles outlined above, they did not expect the star clusters to be 20% redder than predicted. 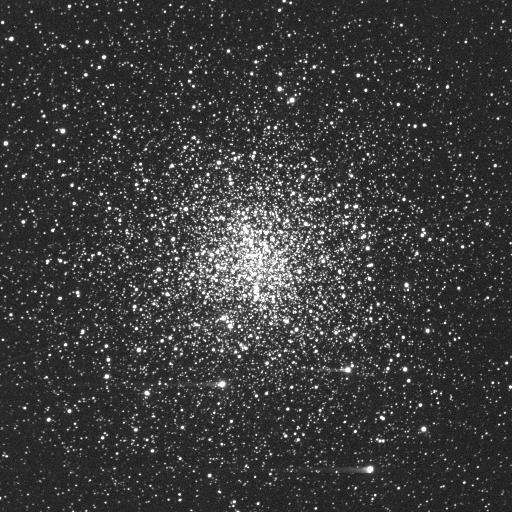 In an assessment of the discovery, Kalirai is quoted as saying that it could be an unexpectedly metal-rich population of globular clusters, or that the stellar models are incorrect. Although it is a frank admission from an honest investigator, the third possibility is that the theory is simply incomplete and not incorrect. In a previous Thunderbolts Picture of the Day we referred to Dr. Don Scott's book The Electric Sky, and showed how he improved the Hertzsprung-Russell diagram of stellar evolution by adding another scale to the horizontal axis: Current Density at the Star's Surface. In so doing, how stars appear when viewed through optical telescopes or x-ray detectors will not be dependent on age and distance, but on the amount of energy flowing into the star from the surrounding environment. The greater the electric current, the hotter and brighter the star will appear. As stars accumulate heavier elements in their cores, they fluctuate in output when their temperatures change due to changes in the fusion reactions taking place. They turn red as one phase ends because the atmosphere expands and the outflow is spread over a larger area, and then they turn yellow or white again as another element starts to fuse into still heavier atoms. However, another of the Hubble team members is quoted as saying, "It's possible there's something about stellar evolution we don't understand." "In the ES model, perhaps the most important factor in determining any given star's characteristics is the strength of the current density in Amperes per square meter (A/m2) measured at that star's surface. If a star's incoming current density increases, the arc discharges on its surface (photospheric tufts) will get hotter, change color (away from red, toward blue), and get brighter. The absolute brightness of a star, therefore, depends on two things: the strength of the current density impinging into its surface, and the star's size (the star's diameter)."